We commissioned this set from our Mongolian friend Shine-Od. Mongolians do not use last names. Shine-Od is a Christian in Mongolia. Both versions of this bust are made from pine wood. The piece is stained. A few natural cracks may appear in the wood along the grain. It measures 9.5 inches wide by 8 inches tall (not including head piece). 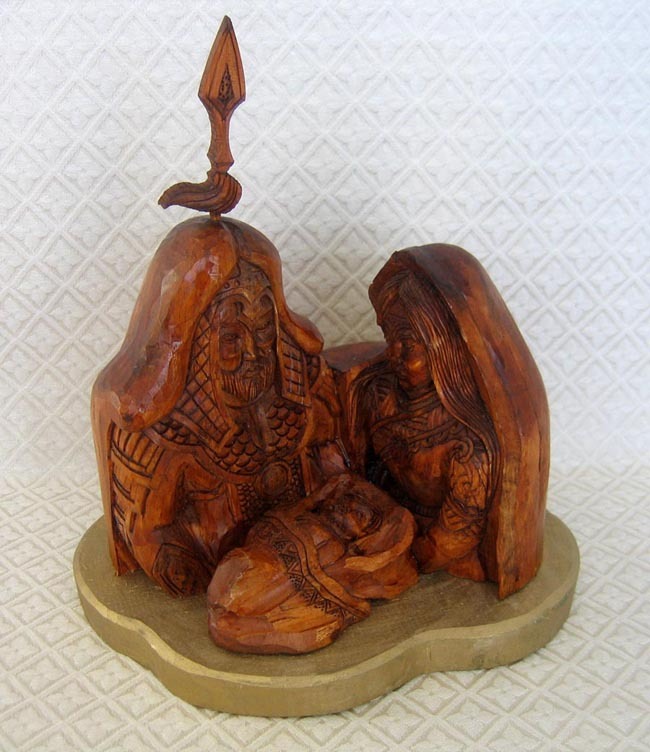 The faces of Mary and Joseph are the primary focus of the carving. Both faces are highly detailed, with attention given to the carving of both Mary’s and Joseph’s hair and beard. Baby Jesus also has a wonderfully round, expressive face. Their clothing reflects beautiful traditional Mongolian dress. Because Genghis Khan is such a huge hero in Mongolia, this bust shows Joseph wearing warrior's clothing in the style of Genghis Khan. This styling is the greatest compliment the artisan can pay to father Joseph.